The creation of this scene and the next few were really done in a vacuum. These were scenes I had been building up to, had known that they were coming, and knew I had to get them done right or it could kind of fall apart. So, unlike the previous chapters, especially Chapter 1, there wasn’t a lot of music playing in the background or outside inspirations. The most work came in the development phase of the chapter, especially when designing The Bishop. I wanted him to be roguish rather than villainous, and so in the development I looked for faces and characters and personalities that could fit that bill. As for the silhouette of the character, I wanted him to be a strong contrast to Long John who is tall, square, and wide. Though I wanted a contrast, I didn’t want Bishop to be weak and frail like Muller in Chapter 1. 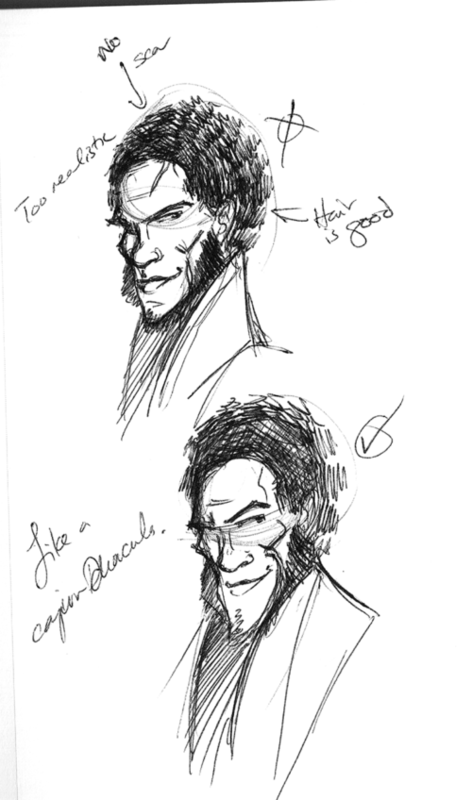 So, the best descriptor I had for Bishop going into his design was lean. He is as pragmatic a character as possible, but his pragmatism hides behind his wit––a sharper version of Juan John. 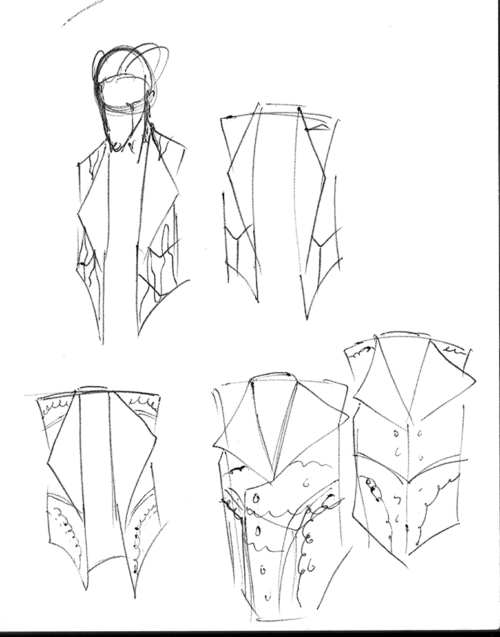 Early sketches helping to define Bishop’s vest. I looked at a lot of period Louisianan creole and cajun cultural costuming. Early designs of The Bishop. 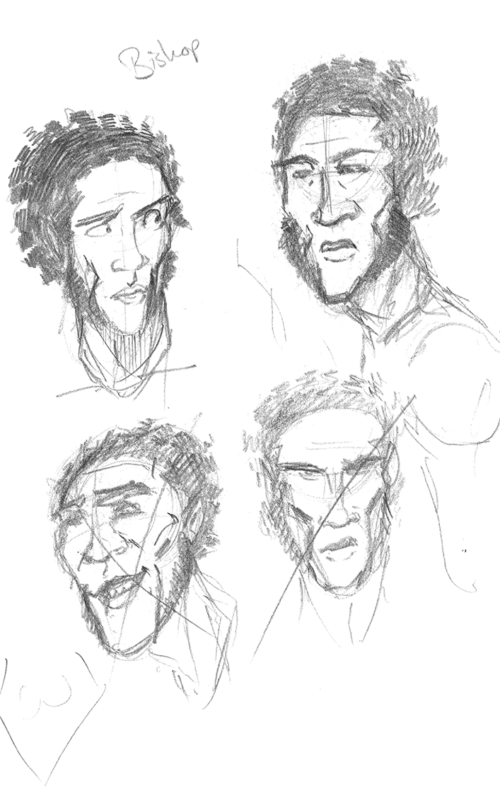 Trying to get a handle on his facial structure. The key was having the kind of upside-down omega symbol that created the outline of his chin and cheeks. This guided his hair design to the acting I used with his body and facial language. Now, while Dracula was a demonic consumer of people, Bishop was far less malevolent; it was more Dracula’s means and personality––when not desperate––that I pulled from. A master of his environment, where when facing off with him it didn’t feel like it was you against him, but he had the very earth under his feet fighting on his side because he had mastered it through the course of his travels. “Like a cajun Dracula.” Once I had kind of a handle on his face, I had to mold it into the Long John style: not too cartoony, not too realistic. Ultimately, I quite enjoy Bishop’s design where, again, I kind of had hopes of drawing him as the protagonist of his own story as I drew him as an antagonist of this one. A calculating mercenary who currently gets his paycheck from Rich Jack Langstrom, Bishop is a man who always finishes the job. 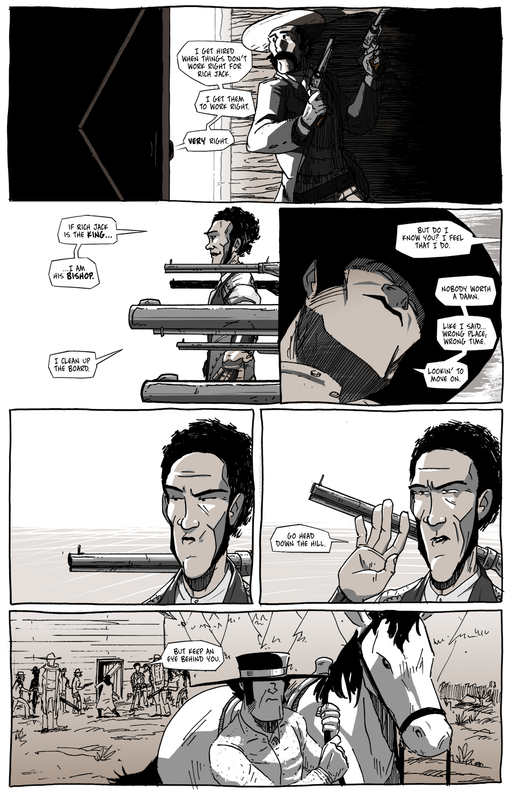 He is less a gunslinger and more of a manipulator, who gets his way less through brute force than through his wide network and years of mysterious experience.